Brown Bess Musket with Bayonet Replica. Our Brown Bess was one of the most renowned flintlock muskets ever produced. Though it is mostly recognized for its use in the Civil war The Brown Bess was also used by the English troops during the colonization of India, America and Australia. Also used by Wellington's troops during the war in the Iberian Peninsula and at Waterloo. It was the great rival of the Americans during the 1812 war. It was then sold to the Mexican troops during the 1846 and 1847 campaigns. 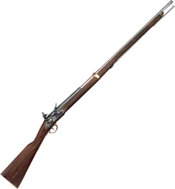 Nearly 3 million of these Brown Bess muskets were manufactured. This non-firing replica is very realistic and sturdy. It is made entirely of wood and metal, no plastic. It is great for display, gun collectors, reenactments or any prop gun application. Overall length including bayonet is 75". Weighs 7 lbs.